Perhaps I was born in the wrong time and as the wrong gender. Not to be an apologist, but if I wanted to be one the great explorers back in the day I don’t think I could have done so as a woman. That is part of the reason why, when anyone asks me if I could go back in time, I really have to think about my answer. To go back in time is to strip away my freedom of movement, to say the least. There are places in the world I still cannot go without feeling heavy judgment. But I will digress further if I don’t stop now. One of my favorite old adventurers is Marco Polo. He might have been in it for the money, but he left a legacy of actually going places and telling people about what he saw. I love that, and I romanticize what it must have been like to cross Asia by land. It was probably slow, and very dangerous, but what an adventure! It’s Marco Polo who deserves credit for my wanting to visit Hangzhou. My guidebook says when he saw Hangzhou, Marco Polo thought it the most beautiful city in the entire world, and quoted as much to the man taking dictation (Polo was in prison in Italy when he dictated much of his travelogue). I like orioles. I like willows. I am ambivalent about peaks, but I like things that are afar! So off I go to Hangzhou, via Shanghai’s bullet train. Alright, a second digression (there might be three): I don’t understand American reluctance to build up our rail system. For twenty bucks I got a first class seat on a train going somewhere around 200km/hour. I made it from Shanghai to Hangzhou in an hour! It was fast, efficient, quiet and comfortable. Even the “second class” tickets looked like seats on the South Shore rail in Illinois/Indiana. We need to stop dragging our heels and get this accomplished. The train sat hundreds and left every hour. I saw it in Europe, and I’m seeing it here – tell all your friends, neighbors, and local politicians that we need more passenger trains and high speed rail! It was cloudy when I got to the Hangzhou South train station. And it was dirty – the train station and the immediate area was crawling with beggars and indifferent taxis. Just off the plaza where I emerged, confused from the tunnels below, a woman was wailing for money next to a man with a thin blanket over his whole body as though he were a corpse. I couldn’t think of a more dismal welcome, an icier bucket of realism. I finally found a taxi to drive me. There was congestion, and cars just started driving on the sidewalks. The buildings were grimy and crowded together. The sky was gray. I was convinced that the guide books had lied, that Marco Polo had seen an oasis, now long covered by concrete and cruel indifference. My hotel was in the new commercial district of Hangzhou. It had planned parks and futuristic architecture. I felt only mildly better, as I don’t have a lot of interest in banking centers. Still, everything was clean and too rich for my shopping habits, so at least I was on familiar ground. Then I met Greg (name changed) the concierge, who proved to be an amazing asset. Greg informed me that I took bus 96, which stopped just outside, and rode it to the end I would be at West Lake, the famous tourist attraction. Furthermore, if I switched to the K7 and rode that to the end, I’d be at the Peak that Flew from Afar, which I really wanted to see. Greg also explained about the public bikes. Like Copenhagen, Hangzhou has a fleet of bicycles for local use, with parking spots all over the city. After explaining how to get a permit to use the bikes (which involved going to the ominous Community Center mentioned in my last post, putting down a 200rmb deposit and providing my passport), Greg excused himself and returned with a plastic card from one the receptionists. “Just one day, so it’s no problem,” he said, saving me at least an hour of bureaucracy. As though Fate was displeased by my sudden turn in mood, she brought rain in the morning. Lots of steady, cool rain. She was courteous enough to also provide a tour bus which took every last umbrella from the concierge. I saw them all on the bus, each holding an orange Marriott umbrella, some looking at me with an innocent “Oh, where’s yours?” I was just about to hunker down and push out when Greg appeared again, holding several shrink-wrapped umbrellas. I thanked him – he was truly earning his gold keys! He was also correct on every front. The 96 did stop just at West Lake, the K7 did go straight to the Peak and the surrounding temples. 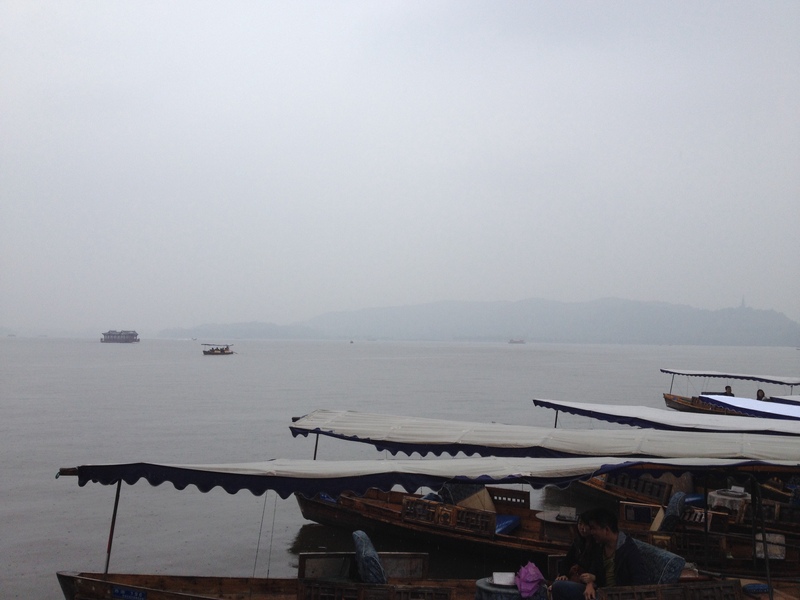 I know that there is a bank on the other side of that lake, a couple of pagodas. I bet it’s really beautiful. West Lake had all the promise of a lovely spot. Green trees arched gracefully over the roads and water. Flowers bloomed in beds of contrasting colors (The gardener in me wanted a little more cohesion), and boats rocked gently on the choppy waters of the lake. If it was any sort of bonus, the rain kept the crowds down. 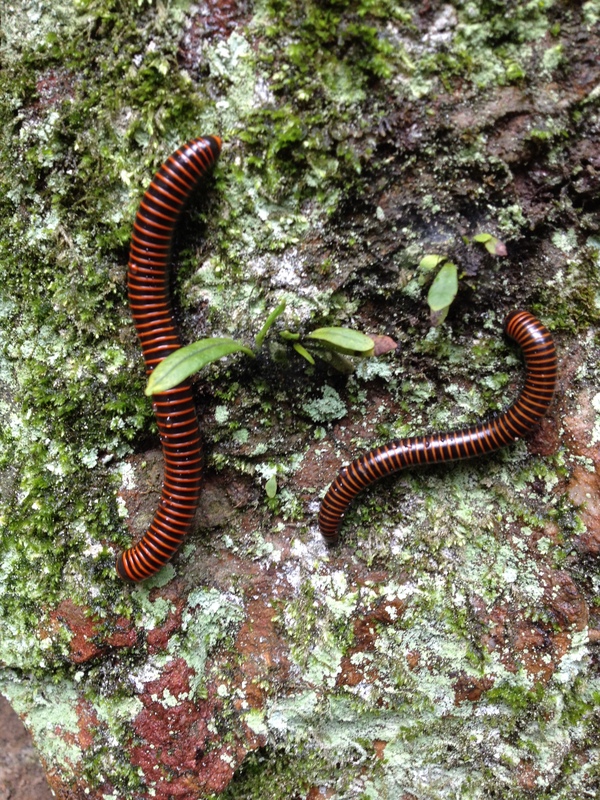 I took the K7 bus through lush forest, richer in color from the rain, to Lingyin Temple and the Peak the Flew from Afar. 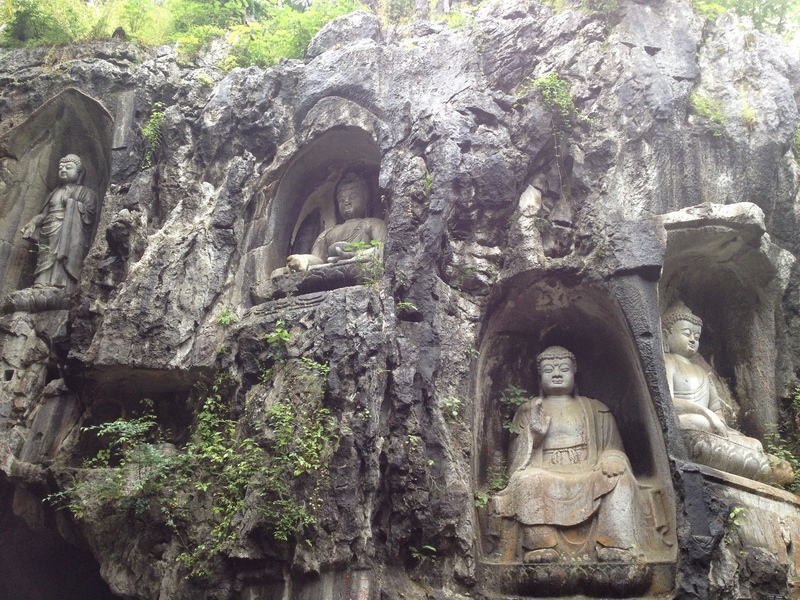 The Peak has roughly 300 Buddha’s and icons carved into the caves and face of the small stone face. It was slippery, but beautiful. 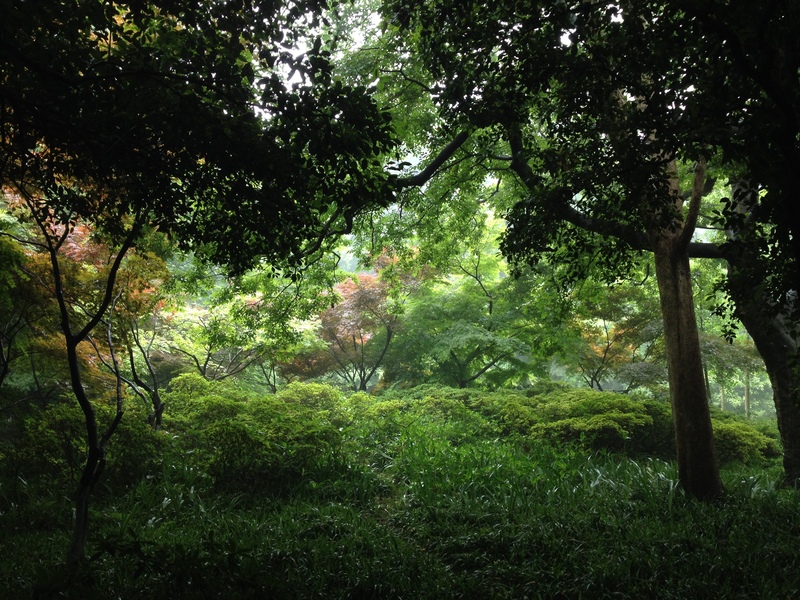 It was at atmospheric place, more so in the lush foliage. 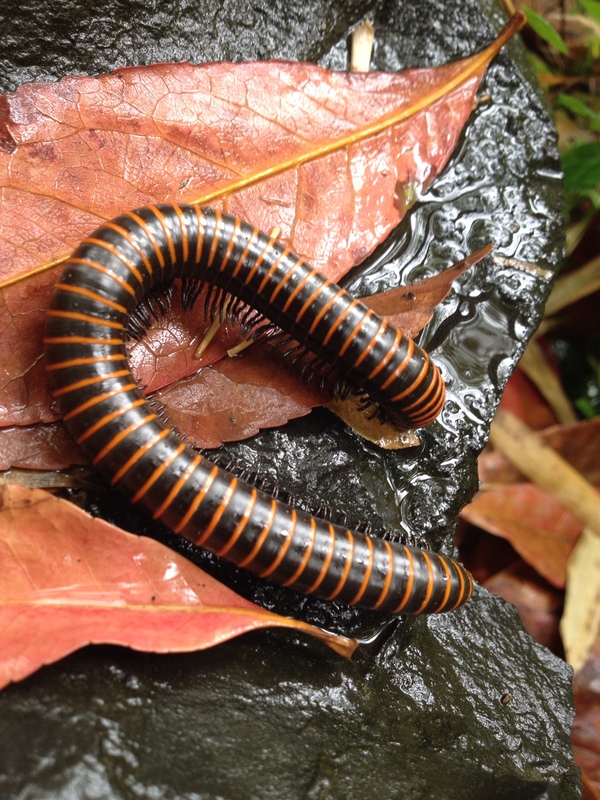 I paid extra to visit Lingyin Temple, and admired the giant millipedes brought out in the wet weather. I lit some incense for my family, and threw a coin into the giant cauldron at the peak. As I reached the small summit, the sun made a heroic effort and sort of emerged. It was still cloudy, but the rain stopped. 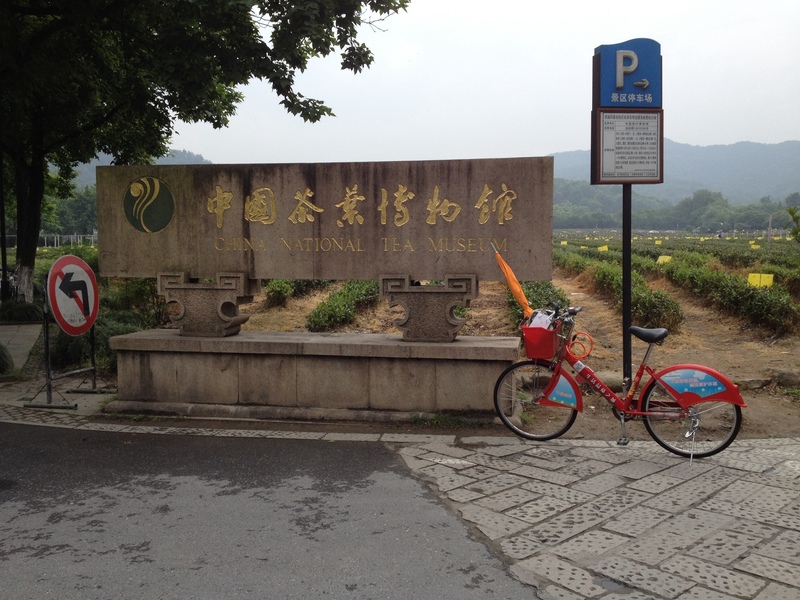 I was able to use my new card to get a bike from the electronic locking post, and rode it to the Chinese Tea Museum. The heavy, thankfully cool air was pungent with tea leaves and the smell of wet ground. The museum was interesting, and I learned some facts about tea, but what I remember now is the smell of the place. It was a soft, sweet smell, underlined by that musky smell of earth. I loved it, especially in the attempted efforts of the sun. It created a fragrant mist which filled the air. In the photo on the right, you can see one of several red bicycles I rented. There’s an additional fee after one hour, so I hopped from bike to bike as needed, since Greg didn’t know how to explain the payment process. 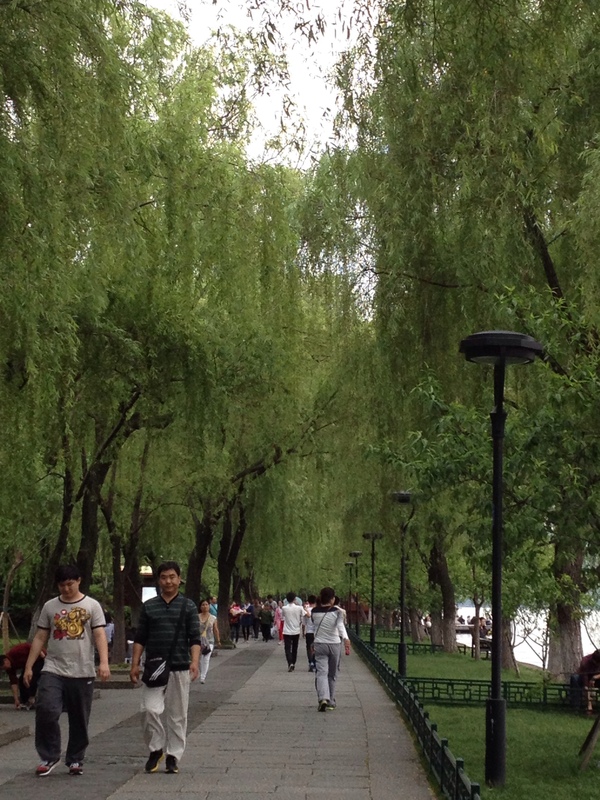 And then I rode back to West Lake, now crowding with people. The clouds returned, and turned everything into muted shades of gray and green. I walked over causeways and small jutting bits of land replete with snack stalls and toy shops. It was lovely, I knew that – it was just a lot of work to see it. By the evening, when I took a boat to see the Three Pools Mirroring the Moon, I was tired. I felt myself trudging – never a good sign. But there was one more place to go – Orioles singing in the Willows. It was not a short walk from where the boat let out, and I had to push myself. I had been going since breakfast, and apart from a couple of fried crabs on a stick I had not eaten. This is my stubbornness – I should have stopped, but I would not. And when I finally collapsed on a park bench, listening to a silver oriole singing in the long, graceful willow branches I was almost too done to appreciate it. To be clear: I was drinking water, and I did eat some snacks. I simply hadn’t stopped moving for roughly eight hours, when I should have. When I’m by myself, I don’t think about time to rest. There’s so much to see, and I don’t have weeks to explore. Still, I sat in the willow area above, contemplating the day. Then I headed back to my hotel. The next day it rained even harder, and I admitted to myself I had no desire to go outside. Instead I spent the day in the executive lounge (thanks, Dad!) writing my stories and drinking excellent tea. 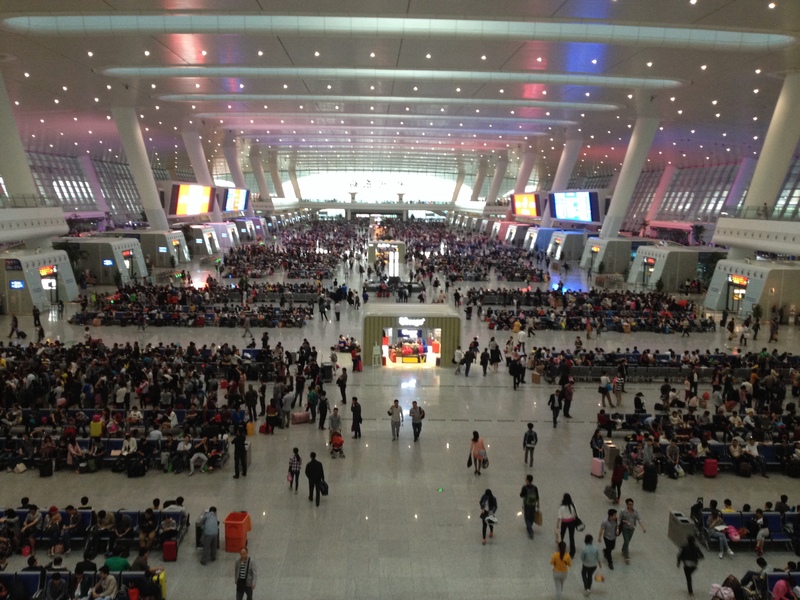 I took a train back to Shanghai – The Hongqiao Train Station is connected to the Hongqiao Airport, so if you’re planning to travel keep that in mind as it’s wonderfully convenient and saves on Taxi fare. 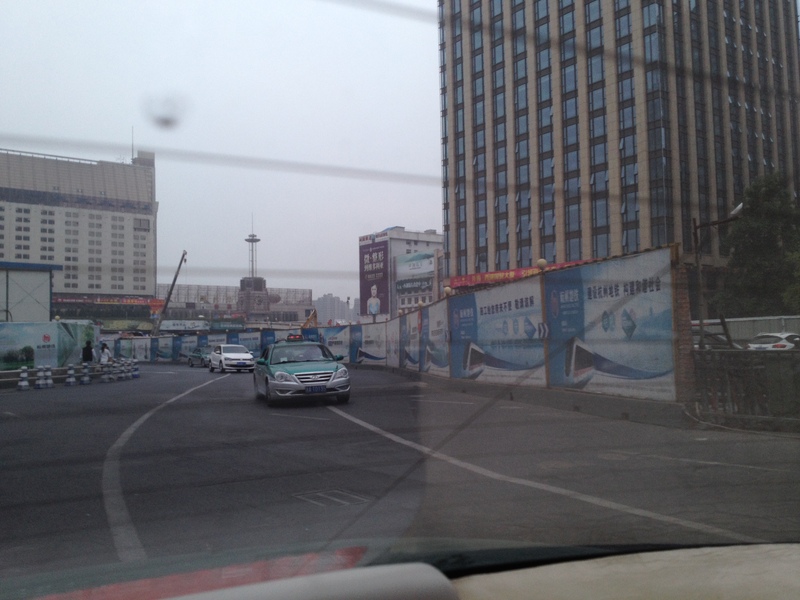 I left from the North Hangzhou train station. I didn’t know that Hongzhou had two train stations – this second one was like landing on Mars. It was massive, white, and gleaming. There were topiaries – topiaries! – outside welcoming me to the city! It was streamlined inside, and full of people. If this had been my introduction to Hangzhou, my first impressions would have been far more flattering. And this was not even a holiday weekend – this just a normal Sunday afternoon. A high speed train trip to the Hongqiao, a walk to the terminal, and I’m on a bumpy flight back to Chengdu. I have a third digression, but I’m going to save it for my next post, since this one is longer than I anticipated. 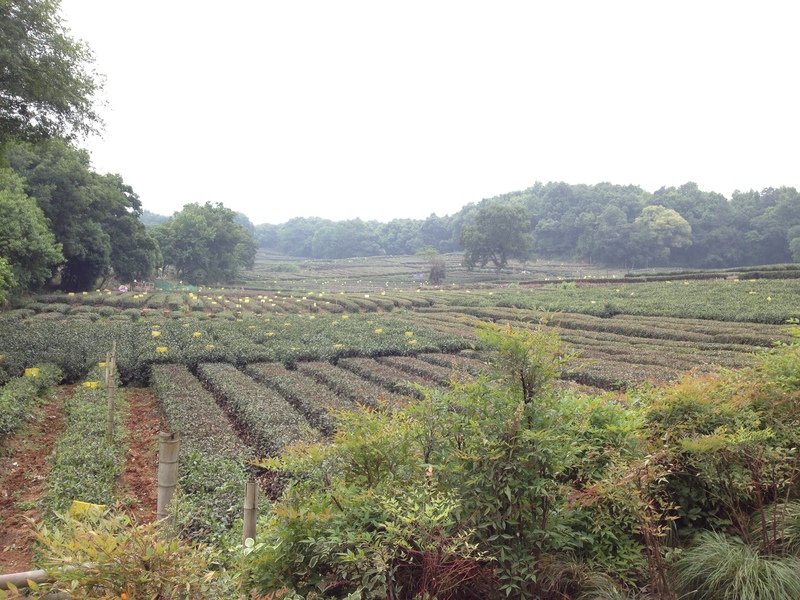 This Post was posted in Places, Travel and tagged China, China National Tea Museum, concierge, Hangzhou, High speed rail, Lingyin Temple, Marco Polo, Orioles, public bikes, rain, travel abroad, Travel in China, walking, West Lake, Willow. Bookmark the permalink.